From the early 1880’s station refreshment rooms were leased to private proprietors under strict conditions. One of the conditions was for the contractor to supply their own crockery. For this reason old crockery is to be found with the actual station name endorsed on it. The original crockery was all imported from England and bore no resemblance to the later-made thick, large stoneware cups and saucers. 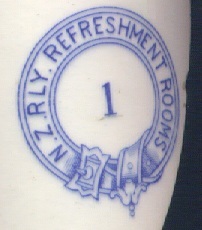 Instead, dainty cups and saucers were made from bone china by well known potters such as Wedgewood, Royal Dalton, W Adams, Johnson Bros and W.H.Grindley & Co. NZR realising that it was a profitable business, began to cancel refreshment room leases from 1917, with the intention of running these highly profitable businesses themselves. For some reason known only to the Railways dept. 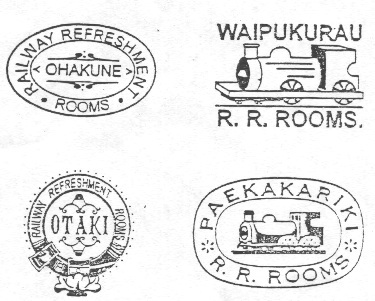 its Refreshment Branch instruction manual of December 1936, said that crockery belonging to a particular North Island refreshment room was not to be used by other rooms than the room it was allocated to. “Foreign” crockery was to be returned to its righful home forthwith. 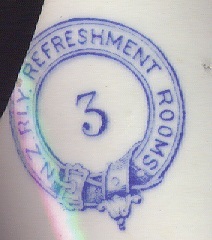 The crockery was numbered and the following table gives the station numbers. There was no such system in place for the South Island. , 1 Whangarei, 2 Paekakariki, 3 Marton, 4 Palmerston North, 5 Woodville, 6 Waipukurau, 7 Taihape, 8 Mercer, 9 Frankton Junction, 10 Taumarunui, 11 Putaruru, 12 Hawera, 13 Kaitoke, 14 Patea, 15 Maungaturoto, 16 Tauranga, 17 Helensville, 18 Paeroa, 19 Masterton, 20 Te Kuiti, 21 Aramoho and 22 Napier. During the 2nd world war it became impossible to obtain crockery from UK. At this time there were no commercial tableware potteries in NZ and with an annual loss of cups and saucers of about 110,000 the situation became desperate. Help came from Amalgamated Brick and Pipe which made its 1st Railways cup in 1940. It was a large stoneware cup with a bold NZR insignia stamped on itin either black or green. Unfortunately the cups had no handles as there was no-one in the country who knew how to attach them. Almalgamated pipe therefore bought out from UK a potter to do this and also to teach others. One penny of the purchase price of a cup of tea went towards the cost of replacing the huge amounts of crockery lost.